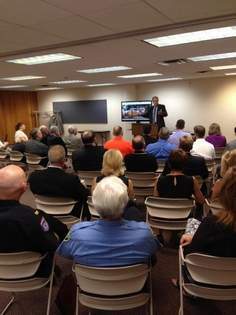 Photo courtesy of the North Canton Chamber.Doug Lane talks about the North Canton Community Growth Association. A new website geared to attract young families to North Canton is going viral. The website, liverightherenorthcanton.com, drew more than 1,000 unique visitors hits within two weeks after it was launched in late July. The North Canton Community Growth Association (NCCGA) attributes the hits to radio, print and cable TV advertising. The message will also appear on Facebook and Linkedin. NCCGA is a new pro-active organization dedicated to maintaining the viability and quality of North Canton residential neighborhoods. A major concern is the increasing number of single-family homes that are being converted to duplexes and rentals. The website contains information about housing, community organizations, news and events as well as the goals of the NCCGA. The website is updated regularly and new ideas are welcome, planners said. Community leaders describe the video campaign as a blend of sophisticated technology and small town appeal. “North Canton is a true community, a family community,” said Jeff Davies, NCCGA Vice President and former North Canton ward 3 councilman. In addition, the school district is losing enrollment because of the aging community, Davis said. Fewer students translates into less money from the state. Other NCCGA officers are Doug Lane, president; Larry Allen, secretary/treasurer; and attorney Jack Baker, statutory agent. “It just keeps us in the loop. The credit for getting this underway is Jeff Davies,” he said. Allen is the founder of Enterprise Power and Baker is an attorney. Davies thanked former North Canton mayor, state representative and senator Dave Johnson for “great and hard work” to fund the project. The Hoover Foundation provided initial funding, along with contributions by Bob DeHoff, Bill Lemmon, NCCGA board members and others. Donations are not only welcome but needed, NCCGA officers agreed, adding that the organization has 501(3)(c) status, making donations tax deductible. In fact, NCCGA is willing to work with property owners who might want to donate land and receive a tax deduction, Davies and Lane said. NCCGA has a long list of future projects, including, but not limited to, increased support of the city’s master plan, building a network of neighborhood groups, grants for community events and beautification of main thoroughfares.